The Boat House is a lovely and accurate reproduction of the lakeside cottage the owner’s family spent countless summers in when he was a boy. 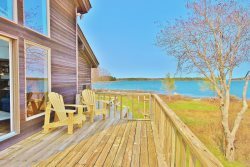 Recently renovated to include a wing for a private bedroom and laundry closet, this is a true year round cottage with all the comforts of home. The Boat House is situated on a lovely, peaceful, private wooded lot at the end of Watts Avenue with access to a body of fresh water known locally as “The Marsh”. The marsh is well-suited for kayaking and canoeing in warm weather, and skating and pond hockey in the winter.. The Village of Tenants Harbor is just a ten minute walk away – in the village you will find the Town Landing, an authentic fish market, a well-stocked general store, post office, several small shops as well as several restaurants such as Luke's Lobsters, East Wind Inn and the Quarry Tavern. Port Clyde Village (home of the Marshall Point Lighthouse and Mohegan Island Ferry) and sandy Drift Inn Beach is just a ten minute drive away – and the larger seaside cities of Rockland and Camden are also close by. The Boat House has an open floor plan and high, vaulted ceilings. The walls look rustic and unfinished, but they are insulated making this a perfect, cozy spot in all seasons. The Boat House is heated with a propane monitor and has another monitor heater in the bathroom. A fantastic Jotul propane fireplace is also included. The bedroom, which is set privately away from the main living area, has a queen bed. In the main room, there is a daybed that can easily be used as a sleeping area. The kitchen has all that is needed to any type of food preparation. The bathroom, lined with antique, reclaimed teak, has a large, walk-in custom shower. There is flat screen tv with DirectTV and Internet for those who need a quiet place with access to the web to work, read or write. WiFi Internet connection is also available. The part guests seem to like the fact the barn doors on the front of the cottage open completely onto the deck – you get a view and fresh, wonderful air when these are open. The Boat House has been outfitted with local antiques and reclaimed architectural elements…for example, the banister leading to the loft (not suitable for sleeping) is from a house on Barter’s Point in Tenants Harbor that was scheduled for demolition. If you want a chance to listen to little more than a lobster boat in the distance and leaves rustling in the wind, this is the place for you. WIFI NOTE:SummerMaine recognizes that access to the internet is as important as electricity and running water to most, if not all, people. However, Maine is a more rural state by nature and infrastructure. Accessibility is limited, often unpredictable and unreliable depending on location. No boats, kayaks or other watercraft are provided due to insurance restrictions. Household Consumables and items: The following items are typically found at the properties to get you started. -Dishwasher, liquid soap for sink dish washing, washing machine detergent. -Approved pets will need a leash. *IN ADDITION TO THE RENTAL AMOUNT, A CLEANING FEE, DOG FEE (if applicable), 9% TAX, AND A PROCESSING FEE (at 6% of the rental amount) ARE REQUIRED. *A NON-REFUNDABLE DEPOSIT OF 1/2 OF THE RENTAL TOTAL IS DUE UPON RESERVATION.